David Mooney scored twice in three minutes as Colchester eased through to the Carling Cup second round with a comprehensive victory over Hereford. Mooney lashed a volley past goalkeeper Adam Bartlett into the roof of the net from eight yards out and then turned in Ian Henderson's cross from close range. Both goals were against the run of play as Matthew Manset, Stuart Fleetwood and Joe Colbeck tested keeper Mark Cousins. But the U's sealed it thanks to Henderson's curling 18-yard shot. "We had a fantastic result on Saturday at Crewe when we have gone away and won, now we have come back home and played decent opposition from a higher league and we've got beaten. "We have to learn from that and the players in there are disappointed and I am disappointed but I am not going to make it a disaster. "It's one game of football that we have lost and we are out of the cup - nobody wants to go out of the cup. "We would have loved a cup run this year but fair play to Colchester they have taken their chances when they had them - when we had chances we didn't take them." "It was very thorough. We've had the few days down in the West country to prepare for that and I thank the chairman for that. "It is something I asked him to do (training days away) and he has supported me in that, and this is what I want this football club to be like. "The three goals were all high quality and I'm sure our supporters will have liked them." 90:00+4:06 Free kick awarded for a foul by Magnus Okuonghae on Sean Canham. Ryan Valentine restarts play with the free kick. 90:00+4:02 Defending throw-in by Ryan Valentine (Hereford). 90:00+3:51 Attacking throw-in by Kayode Odejayi (Colchester). 90:00+3:08 Janos Kovacs fouled by Kayode Odejayi, the ref awards a free kick. Direct free kick taken by Adam Bartlett. 90:00+3:02 Attacking throw-in by Marc Tierney (Colchester). 90:00+2:16 Booking Ian Henderson booked. 90:00+2:12 Booking The referee cautions Ryan Green for unsporting behaviour. 90:00+0:44 Michael Townsend gives away a free kick for an unfair challenge on Kayode Odejayi. Lloyd James takes the free kick. 89:16 Goal kick taken long by Mark Cousins (Colchester). 88:56 Sam Malsom has an effort at goal from close in that hits the post. 88:50 Ryan Green delivers the ball. 88:21 Free kick awarded for a foul by Kayode Odejayi on Janos Kovacs. Janos Kovacs takes the free kick. 88:00 Effort on goal by Sean Canham from deep inside the penalty area misses to the right of the goal. 87:37 Daniel Stratford takes a shot. Mark Cousins makes a save. Corner taken right-footed by James McQuilkin from the right by-line to the near post, clearance by Magnus Okuonghae. 86:45 Kemal Izzet gives away a free kick for an unfair challenge on Stuart Fleetwood. The free kick is swung in right-footed by James McQuilkin. 86:24 Attacking throw-in by Ryan Valentine (Hereford). 85:53 Substitution Ashley Vincent joins the action as a substitute, replacing Anthony Wordsworth. 85:02 Corner taken by Anthony Wordsworth from the right by-line, Kayode Odejayi takes a shot. Save made by Adam Bartlett. 84:39 Attacking throw-in by Brian Wilson (Colchester). 83:35 Foul by Lloyd James on James McQuilkin, free kick awarded. Adam Bartlett takes the direct free kick. 83:12 The ball is sent over by Brian Wilson, Michael Townsend makes a clearance. 82:54 Attacking throw-in by Brian Wilson (Colchester). 82:32 Outswinging corner taken right-footed by Ian Henderson from the right by-line to the near post, Sean Canham manages to make a clearance. 82:16 Kayode Odejayi takes a shot. Blocked by Ryan Valentine. 81:39 The ball is sent over by Ryan Valentine. 81:23 Attacking throw-in by Ryan Valentine (Hereford). 79:37 The referee blows for offside. Mark Cousins takes the free kick. 78:49 Inswinging corner from left by-line taken right-footed by James McQuilkin (Hereford) to centre, resulting in ball out of play. Goal kick taken long by Mark Cousins (Colchester). Correction - 78:49 Inswinging corner taken by James McQuilkin from the left by-line played to the near post. 78:01 Goal kick taken long by Adam Bartlett (Hereford). 77:50 Defending throw-in by Ryan Valentine (Hereford). 76:28 Free kick awarded for an unfair challenge on Paul Reid by Sean Canham. Direct free kick taken by Mark Cousins. 76:10 The offside flag is raised against Sean Canham. Mark Cousins restarts play with the free kick. 75:32 Substitution Sean Canham on for Mathieu Manset. 74:53 Substitution (Hereford) makes a substitution, with Sam Malsom coming on for Joe Colbeck. 74:53 Foul by Kayode Odejayi on Michael Townsend, free kick awarded. 73:45 Mathieu Manset challenges Kemal Izzet unfairly and gives away a free kick. Direct free kick taken by Mark Cousins. 71:50 Corner from right by-line crossed in by Ian Henderson. Unfair challenge on Kemal Izzet by Mathieu Manset results in a free kick. Free kick taken by Ian Henderson. Mathieu Manset challenges Kemal Izzet unfairly and gives away a free kick. Free kick taken by Mark Cousins. 71:06 Substitution Kayode Odejayi is brought on as a substitute for David Mooney. 68:36 Defending throw-in by Brian Wilson (Colchester). 68:30 Joe Colbeck delivers the ball. 67:53 Defending throw-in by Ryan Green (Hereford). 67:14 Attacking throw-in by Brian Wilson (Colchester). Correction - 67:14 Attacking throw-in by Marc Tierney (Colchester). 66:53 Defending throw-in by Brian Wilson (Colchester). 66:02 Attacking throw-in by Ryan Green (Hereford). 65:47 Defending throw-in by Ryan Green (Hereford). 64:20 Assist on the goal came from Anthony Wordsworth. 64:20 GOAL - Ian Henderson:Hereford 0 - 3 Colchester Ian Henderson fires in a goal from the edge of the penalty area to the top right corner of the goal. 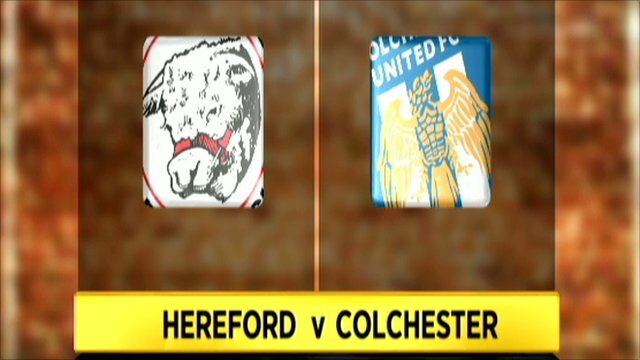 Hereford 0-3 Colchester. 64:00 Defending throw-in by Ryan Green (Hereford). 63:43 Goal kick taken long by Adam Bartlett (Hereford). 62:43 David Perkins takes the direct free kick. 62:43 Booking Booking for James McQuilkin for unsporting behaviour. 62:40 Free kick awarded for an unfair challenge on David Perkins by James McQuilkin. 62:23 Centre by Ryan Valentine, clearance made by Magnus Okuonghae. 61:54 Defending throw-in by Brian Wilson (Colchester). 61:51 Goal kick taken long by Adam Bartlett (Hereford). 61:37 David Mooney has a headed effort at goal from deep inside the area missing to the right of the target. 60:19 Free kick taken by Mark Cousins. 60:19 Booking Caution for Mathieu Manset. 59:37 Unfair challenge on David Perkins by Mathieu Manset results in a free kick. 58:00 Goal kick taken long by Adam Bartlett (Hereford). 57:50 David Mooney takes a shot and went wide right of the goal. 57:34 Attacking throw-in by Marc Tierney (Colchester). 57:11 Centre by Ryan Valentine, Mark Cousins makes a comfortable save. 56:32 Corner taken by James McQuilkin from the left by-line to the near post, Brian Wilson makes a clearance. 56:06 Substitution (Colchester) makes a substitution, with Lloyd James coming on for Andy Bond. 55:38 Mathieu Manset is ruled offside. Free kick taken by Mark Cousins. 55:22 Attacking throw-in by Ryan Green (Hereford). 55:09 Attacking throw-in by Joe Colbeck (Hereford). 54:13 Defending throw-in by Brian Wilson (Colchester). 53:29 Anthony Wordsworth gives away a free kick for an unfair challenge on Ryan Green. Direct free kick taken by Janos Kovacs. 53:24 Defending throw-in by Marc Tierney (Colchester). 53:03 Substitution Daniel Stratford replaces O'Neil Thompson. 50:41 A cross is delivered by Brian Wilson, Andy Bond takes a shot. Adam Bartlett makes a save. 48:34 Foul by Brian Wilson on Stuart Fleetwood, free kick awarded. Joe Colbeck crosses the ball from the free kick right-footed from left channel. 48:08 Attacking throw-in by Ryan Green (Hereford). 47:09 Attacking throw-in by Marc Tierney (Colchester). 46:53 Cross by Ian Henderson (Colchester), resulting in open play. Correction - 46:53 Centre by Ian Henderson, Ryan Green makes a clearance. 46:20 A cross is delivered by Kenny Lunt, clearance made by Andy Bond. 45:45 Corner from the left by-line taken by James McQuilkin, clearance by Paul Reid. 45:00+0:52 David Perkins takes a shot. Save by Adam Bartlett. 45:00+0:35 Inswinging corner taken by Anthony Wordsworth from the right by-line played to the near post, Ryan Valentine makes a clearance. 43:20 Ian Henderson provided the assist for the goal. 43:20 GOAL - David Mooney:Hereford 0 - 2 Colchester David Mooney finds the net with a goal from deep inside the penalty box to the bottom left corner of the goal. Hereford 0-2 Colchester. 42:28 Attacking throw-in by Brian Wilson (Colchester). 42:09 The referee blows for offside. Mark Cousins takes the direct free kick. 41:37 Attacking throw-in by Marc Tierney (Colchester). 40:41 The ball is swung over by Ryan Green, save made by Mark Cousins. 39:28 The assist for the goal came from Marc Tierney. 39:28 GOAL - David Mooney:Hereford 0 - 1 Colchester David Mooney finds the net with a goal from inside the box to the top left corner of the goal. Hereford 0-1 Colchester. 38:33 Goal kick taken long by Adam Bartlett (Hereford). 36:43 Attacking throw-in by Brian Wilson (Colchester). 36:34 David Mooney delivers the ball, James McQuilkin makes a clearance. 35:39 Handball by David Mooney. Adam Bartlett restarts play with the free kick. 35:15 Mathieu Manset takes a shot. Save by Mark Cousins. 34:25 Goal kick taken long by Adam Bartlett (Hereford). 33:40 The ball is sent over by Marc Tierney, save by Adam Bartlett. 33:19 Defending throw-in by Marc Tierney (Colchester). 32:30 The ball is sent over by Joe Colbeck, Paul Reid manages to make a clearance. 32:22 The ball is sent over by James McQuilkin, clearance made by Paul Reid. 32:01 Corner from left by-line taken short left-footed by Ryan Valentine (Hereford). Correction - 32:01 Short corner taken by Stuart Fleetwood. 31:29 Foul by Brian Wilson on Joe Colbeck, free kick awarded. Ryan Green takes the direct free kick. 31:01 Goal kick taken long by Adam Bartlett (Hereford). 30:52 The ball is sent over by Brian Wilson, Janos Kovacs manages to make a clearance. 29:51 Defending throw-in by Ryan Green (Hereford). 29:21 Mathieu Manset takes a shot. Save by Mark Cousins. 29:00 Mathieu Manset fouled by Magnus Okuonghae, the ref awards a free kick. Free kick taken by O'Neil Thompson. 28:35 Attacking throw-in by Brian Wilson (Colchester). 28:23 Stuart Fleetwood delivers the ball, David Perkins manages to make a clearance. 27:59 Attacking throw-in by Ryan Valentine (Hereford). 27:33 Goal kick taken long by Mark Cousins (Colchester). 26:29 Goal kick taken long by Adam Bartlett (Hereford). 26:24 Attacking throw-in by David Perkins (Colchester). 26:01 Defending throw-in by Brian Wilson (Colchester). 25:38 Defending throw-in by Brian Wilson (Colchester). 25:19 David Mooney crosses the ball, Ryan Valentine makes a clearance. 24:50 Attacking throw-in by Ian Henderson (Colchester). 23:45 Outswinging corner taken from the right by-line by James McQuilkin. 23:14 Corner taken by James McQuilkin from the right by-line. 22:25 Defending throw-in by Ryan Green (Hereford). 22:07 The ball is crossed by Brian Wilson. 21:31 Stuart Fleetwood takes a shot. Save made by Mark Cousins. 21:03 Goal kick taken long by Adam Bartlett (Hereford). 20:50 Attacking throw-in by Brian Wilson (Colchester). 20:44 Attacking throw-in by Brian Wilson (Colchester). 19:45 The referee blows for offside against Anthony Wordsworth. Free kick taken by Adam Bartlett. 19:21 Attacking throw-in by Marc Tierney (Colchester). 18:52 Goal kick taken long by Adam Bartlett (Hereford). 18:36 Shot by Andy Bond (Colchester) left-footed from right channel (25 yards), missed right. Correction - 18:36 Andy Bond has an effort at goal from outside the box which goes wide right of the target. 17:46 Outswinging corner taken by James McQuilkin from the right by-line, David Mooney manages to make a clearance. 17:36 Attacking throw-in by Ryan Green (Hereford). 17:12 Brian Wilson sends in a cross, clearance by Janos Kovacs. 17:01 Attacking throw-in by Anthony Wordsworth (Colchester). 16:45 Defending throw-in by Brian Wilson (Colchester). 16:39 Defending throw-in by Brian Wilson (Colchester). 15:45 Ian Henderson challenges Mathieu Manset unfairly and gives away a free kick. Direct free kick taken by Ryan Valentine. 15:33 Defending throw-in by Ryan Valentine (Hereford). 14:52 Joe Colbeck takes a shot. Save made by Mark Cousins. 13:44 Defending throw-in by Ryan Valentine (Hereford). 13:30 Attacking throw-in by Brian Wilson (Colchester). 12:43 Ian Henderson is caught offside. Indirect free kick taken by Adam Bartlett. 12:07 Stuart Fleetwood challenges Kemal Izzet unfairly and gives away a free kick. Brian Wilson takes the free kick. 11:32 Short corner taken by Ian Henderson from the right by-line. 10:42 Attacking throw-in by Marc Tierney (Colchester). 10:07 Goal kick taken long by Mark Cousins (Colchester). 9:55 Mathieu Manset has a headed effort from close in and clears the bar. 9:32 Free kick awarded for a foul by Marc Tierney on Joe Colbeck. James McQuilkin takes the free kick. 8:54 Defending throw-in by Brian Wilson (Colchester). 7:52 Corner from right by-line taken short right-footed by Kemal Izzet (Colchester). Cross by Brian Wilson (Colchester), clearance by Ryan Green (Hereford). Correction - 7:52 Corner taken short by Ian Henderson, The ball is swung over by Brian Wilson, clearance made by Ryan Green. 7:48 Defending throw-in by Brian Wilson (Colchester). 7:20 Attacking throw-in by Brian Wilson (Colchester). 7:10 Attacking throw-in by Ryan Valentine (Hereford). Correction - 6:52 Attacking throw-in by Ryan Valentine (Hereford). 6:52 Defending throw-in by Ryan Valentine (Hereford). 6:24 Goal kick taken long by Mark Cousins (Colchester). 5:28 Goal kick taken long by Mark Cousins (Colchester). 4:35 Unfair challenge on Joe Colbeck by David Perkins results in a free kick. The free kick is swung in right-footed by James McQuilkin, clearance by Marc Tierney. 4:14 Defending throw-in by Ryan Green (Hereford). 3:45 Foul by Joe Colbeck on David Perkins, free kick awarded. Direct free kick taken by Mark Cousins. 3:06 Goal kick taken long by Adam Bartlett (Hereford). 1:58 Free kick awarded for an unfair challenge on Andy Bond by O'Neil Thompson. Brian Wilson restarts play with the free kick. 1:50 Attacking throw-in by Stuart Fleetwood (Hereford). 0:36 Anthony Wordsworth decides to take a short corner. 0:16 Ian Henderson takes a shot. Save by Adam Bartlett.